Cavities are a result of tooth decay. 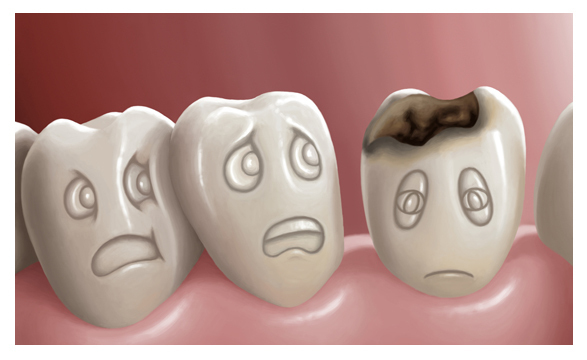 Tooth decay is damage to teeth and can affect both the outer coating of a tooth and the inner layer. Bacteria in our mouths turn food into acids. Acid, food debris and saliva combine to form plaque that sticks to our teeth. Acids in plaque dissolve the enamel, creating holes called cavities. From young children to older adults everyone can get cavities. In fact, as we age our gums pull away from our teeth for natural reasons. This exposes the roots of our teeth to plaque. Sugary or high-carb foods are most likely to give us cavities. 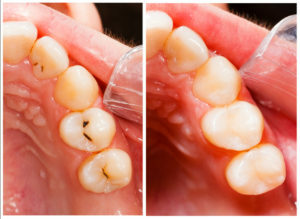 Decay also affects older adults around the edges of fillings. Adults with a lot of dental work that didn’t get fluoride or good oral care when they were kids often suffer from decay. This is due to fillings causing teeth to weaken and break. These gaps allow bacteria to gather and cause decay. Dentists are trained to find cavities during regular dental checkups. The procedure is usually to probe our teeth, looking for soft spots, or use X-rays to check between our teeth. Cavities can give us toothaches, especially when eating or drinking sugary things. Also, teeth become sensitive to hot or cold temperatures. Cavities look like small pits or holes in our teeth. If left untreated, uncontrolled decay may destroy the tooth completely. There is also the risk of developing an infection related to an abscess. This is when the infection spreads to the root of the tooth. Treatment depends on how bad the cavity is. Most often, dentists remove the decayed part of your tooth with a drill. He fills in the hole with a filling made of either silver alloy, gold, porcelain, or a composite resin. These materials are safe. Some people have raised concerns about mercury-based fillings called amalgams. But the American Dental Association, the FDA, and other public health agencies say it is safe. Also, allergies to filings are rare. Crowns are used when a tooth is so decayed that not much of it remains. Your dentist removes and repairs the damaged part. He fits a crown made from gold, porcelain, or porcelain fused to metal over the rest of the tooth. You might need a root canal if the root or pulp of your tooth is dead or injured in a way that can’t be repaired. For a root, canal dentists remove the nerve, blood vessels, and tissue along with the decayed portions of the tooth. He fills in the roots with a sealing material. You may need a crown over the filled tooth. Brushing and flossing daily helps reduce amounts of plaque and bacteria in our mouth. Eating less sugary or starchy foods will help reduce the number of acids in our mouth. Fluoride toothpaste strengthens teeth, as well as fluoride treatments or taking fluoride supplements. For more information about cavities or other procedures schedule an appointment with us today. Don’t hesitate to ask any of our highly skilled dentists about the options you might have as well to clear up any doubts about the procedure.